Bugbrooke Men Serving in the Great War. The 100 Years Project is looking at the village of Bugbrooke and its people during the period of the Great War from 1914 to 1918. An article will be written for the Bugbrooke LINK to coincide with each issue, and reflecting what was happening to the village and its people, particularly those serving in the war, exactly 100 years ago in the two months leading up to that particular LINK issue. This page contains this overview, a list of those who served with links to a data sheet giving all of the invormation we have found on that person. There are also links to additional stories which we have come across whilst doing the research, and which we feel should be told.Some of these have been published in the LINK Magazine where space has allowed. 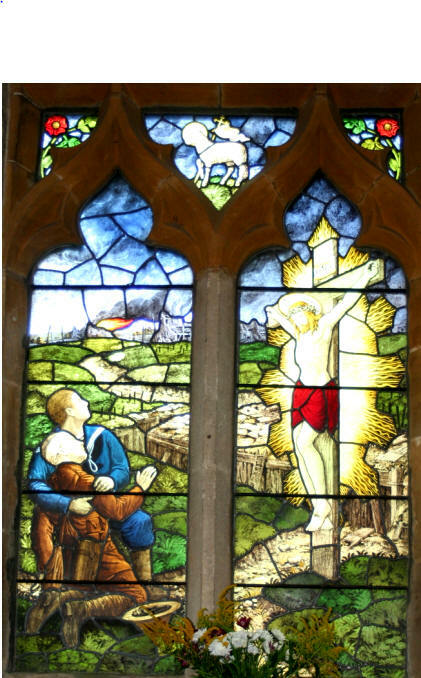 The Remembrance Window Bugbrooke Church, commemorating those Bugbrooke men who died in the Great War. letters from past pupils from around the world. school log books for the period up to 1918. In addition Herbert Farmer was born in Bugbrooke, and was killed in the First World War. He is remembered on the war memorial in Weedon, where his parents had moved to before the war. Albert Reuben Davis was killed in action in Flanders 9th May 1915. He does not appear on the church memorial. Also James Fleming is not on the memorial He married a Bugbrooke girl, and his address in the war records is Rose Tree Cottage Bugbrooke. 28th June 1914—assassination of Arch Duke Ferdinand, heir to the Austro-Hungarian throne, by a Serb nationalist . 1st August—Germany, allied to Austria-Hungary declared war on Russia. 4th August—Britain, to honour its guarantees to Belgium declared war on Germany. With Britain's entry into the war, her colonies and dominions abroad variously offered military and financial assistance, and included Australia, Canada, India, New Zealand and the Union of South Africa. 7th August—Austria-Hungary responded by declaring war on Japan.